As 30 Kentucky schools closed statewide Friday while teachers traveled to the state Capitol in Frankfurt to show support for increased funding for public education, Republican Gov. Matt Bevin told a reporter that children were harmed by the school closures. "I guarantee you somewhere in Kentucky today a child was sexually assaulted that was left at home because there was nobody there to watch them," Bevin said in a video posted to Twitter by WDRB-TV reporter Marcus Green. "I guarantee you somewhere today a child was physically harmed or ingested poison because they were home alone because a single parent didn't have any money to take care of them. I'm offended by the idea that people so cavalierly and so flippantly disregarded what's truly best for children." Kentucky lawmakers on Friday voted to override the Republican governor's veto of a two-year operating budget that increases public education spending with the help of a $480 million tax increase. Kentucky is one of several states, including West Virginia, Oklahoma and Arizona, to be roiled by teacher protests in recent weeks. The surge of activism is enough to cast doubts on whether Republicans can keep control of the state House of Representatives in the fall and whether Bevin, an ally of the Trump administration, could survive a re-election campaign in 2019. After electing a Republican governor in 2015 and giving the party full control of the state legislature for the first time in 2016, it seemed the GOP had solidified its grip on Kentucky for years to come. But the legislature's rush to change the state's troubled public pension system, coupled with Bevin's burn-the-bridges approach to politics, has led to a wave of protests and prompted at least 40 current and former teachers to run for public office this year - most of them Democrats. Bevin has not said if he will seek a second term. Representatives in his office did not respond to an email seeking comment. Republican Rep. Melinda Gibbons Prunty, one of 17 new GOP members who ousted Democratic incumbents in 2016, said Saturday she did not know if Bevin's political future is in doubt. But she knows her own re-election is in trouble. "I'm embarrassed by (Bevin's comments). I can't defend it," she said. "I felt like we were finally getting some calm and he just kind of, you know, stirs the hornets' nest." In one of its final acts of 2018, the Kentucky House of Representatives, where Republicans hold 63 of out of 100 seats, approved two resolutions formally condemning Bevin's comments. Republican Senate President Robert Stivers called Bevin's comments "indefensible." But he scoffed at the notion of Republican rule being in jeopardy. "I think Republicans will control both chambers this time next year," Stivers said. "I don't see any type of political turmoil or problems." Republican Rep. Jim DuPlessis has seen it in his district. Six months ago, he said people would speak kindly to him in public. Now, some confront him with "a different mentality than they ever had before." "(Gov. Bevin's) rhetoric made this a toxic situation," DuPlessis said. "It's hard for us to get our jobs done because it made people think we were out to get them when we truly weren't." Other Republican lawmakers facing contested re-election campaigns said they weren't worried about the future of the party. The included Republican Rep. Adam Koenig from the northern Kentucky suburbs of Cincinnati, where Bevin has some of his strongest support. He noted the pension changes they passed do not affect current or retired teachers, and once people realize that "I think a lot of this will go by the wayside." But Koenig noted he had many constituents call him and ask that he vote to override Bevin's veto of the two-year operating budget that included increased classroom spending. "They are all going to get calls from me saying you asked and I delivered," he said. Three years ago, Robin Cooper voted for Bevin. An occupation therapist in Kentucky's second-largest school district, she was one of thousands protesting. "This is not what I would have voted for had I known he was going to harass and try to ridicule and try to intimidate teachers," Cooper said. 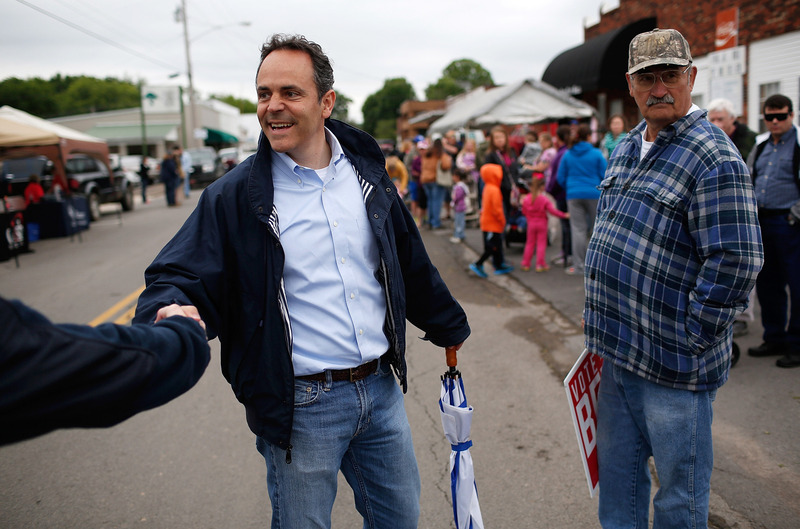 "That makes me second guess his character and his vision for the Kentucky that I want."